pany (owners of the East India, West India and Tilbury docks), Surrey Commercial Docks Company and London & St Katharine Docks Company (owners of the London, St Katharine and Royal docks). By the beginning of the 20th century competition and strikes led to pressure for amalgamation. 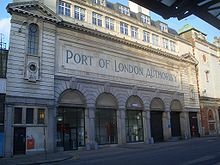 A Royal Commission led to the setting up of the Port of London Authority (PLA) in 1908. In 1909 the PLA took control of the enclosed docks from Tower Bridge to Tilbury, with a few minor exceptions such as Poplar Dock which remained as a railway company facility. It also took over control of the river between Teddington Lock and Yantlet Creek from the City corporation which had been responsible since the 13th century. The PLA head Office at Trinity Square Gardens was built by John Mowlem & Co and completed in 1919. The PLA dredged a deep water channel, added the King George V Dock (1920) to the Royal group, and made continuous improvements to the other enclosed dock systems throughout the first two thirds of the 20th century. This culminated in expansion of Tilbury in the late 1960s to become a major container port (the UK's largest in the early 1970s), together with a huge riverside grain terminal and mechanised facilities for timber handling. Under the PLA London's annual trade had grown to 60 million tons (38% of UK trade) by 1939, but was mainly transferred to the Clyde and Liverpool during World War 2. After the war London recovered, again reaching 60 million tons in the 1960s.